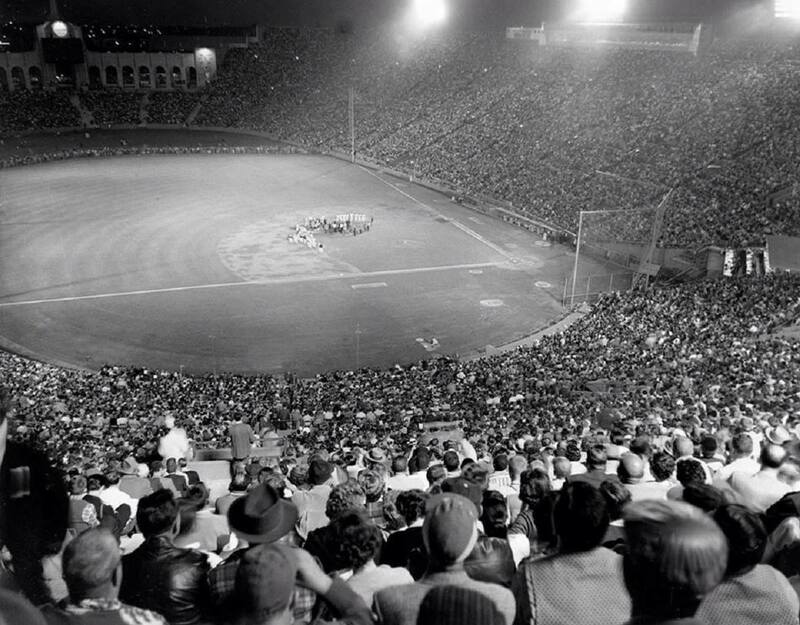 Here's a fantastic vintage photo recently shared by Old Time Baseball Photos on twitter of the "Roy Campanella Night" exhibition game at the LA Coliseum between the Dodgers and Yankees in early May, 1959. This Day in Dodgers History: In 1941 the Dodgers signed future Hall of Famer Paul Waner to a free agent contract. In 1972 former Brooklyn Dodger players Rube Marquard (known mostly as a Giant) and Dave Bancroft (also mostly a Giant) were selected by an Hall of Fame Special Veterans Committee for enshrinement. In 2001 a certain article was published in the WSJ related to the most infamous pennant race in National League history. Written by Joshua Prager, he details how the Giants team stole catchers' signs during the 1951 pennant race -- overcoming a Dodgers 13.5 game lead. You can read the original article here. In 2003 the Dodgers signed free agent pitcher Wilson Alvarez. In 2005 the Dodgers signed pitcher Scott Erickson as a free agent. Via Connor Byrne at MLB Trade Rumors; "Dodgers Sign Mark Lowe To Minors Pact." ICYMI: Via Rowan Kavner at Dodger Insider; "Dodgers announce 22 non-roster invitees at 2018 Spring Training." Via Mike Oz at Big League Stew; "To limit cheating, MLB will reportedly start listening to dugout phone calls." Per Bill Ladson at MLB.com; "Lopes 'taking it easy' after calling it quits: After 45 years playing, coaching, Lopes has no regrets about career." "I always liked what I was doing," Lopes said. "Once you have guys who will listen to certain things that you are trying to teach, like I did when I was in Philadelphia ... we had a lot of fun. We went to the World Series; we won it. We didn't quite win the second one. You have to have students and guys that love to play, want to learn and want to win. That's even more important. I had the opportunity to work with a lot of people. You don't do this thing alone." Former Phillies and Nationals outfielder Jayson Werth once called Lopes the best coach he ever had. "He was really good [when it came to] my overall mentality toward the game and how to play the game," Werth said. "He was very instrumental and kind of molded me into the player I became." Data compiled from prior All-Star Week host cities, between 2007 - 2017, indicates that an All-Star Week brings an average economic impact of$89.4 million to host cities. In addition to the ASG itself, All-Star Week has included events such as: All-Star FanFest, a 5K run, a gala, a red carpet event, apublic concert, PlayBall Park, and a number ofother community-based events (“AllStar Events”). It is anticipated that by hosting the All-Star Week in Los Angeles similar economic opportunity will generate tens ofmillions ofdollarsto the local economy while also promoting civic pride and enthusiasm. The Los Angeles Dodgers have also agreed to work with the City of Los Angeles to identify local charitable and nonprofit organizations to be the recipients of $1.5 million in All-Star Week legacy funds. Per Austin Laymance at MLB.com; "With Kemp in mix, Dodgers full of LF options: Pederson, Toles among those who will battle for starting job in Spring Training."